Before me was the gigantic image of Adinath, the first Tirthankara, of this era, sitting crosslegged, no clothes on his body, his expression serene. Above in the ceiling was an exquisitely carved marble leaf of the wish-fulfilling tree, the Kalpa-vriksha. If you stand below it and make a wish, it will be granted. That’s what the tourist guide said and so a queue of eager pilgrims had already formed, ready to make their wish. As I made my, I overheard a lady chuckle, ‘They don’t seem to get the irony. Above is the leaf that fulfils all your desires. And before them is the sage, once king of all the world, who has given up all that he possessed, for he has outgrown all desires.’ I withdrew sheepishly. Pointing to a tiny statue on a pillar, I heard the tourist guide say, ‘That is the only image of the man who built this magnificent temple, Dhanna Shah. He agreed to have his image placed here after much persuasion, but insisted it should not be more than the span of a hand, and should not block anyone’s view of the mula nayak, unlike the sponsors and patrons of today’s temples.’ Mula nayak is the term used for the sacred icon enshrined in a Jain temple, for unlike Hindu temples that enshrine gods mostly, the Jain temple enshrines a sage, the Tithankara, who has attained the highest state of realisation, kaivalya. I stared at the man, sometimes identified as Dharana Shah, whose money and vision created the magical temple of Ranakpur nearly six centuries ago on the lush green valley of the Aravalli, in the Pali district of Rajasthan, about 100 kilometers from Udaipur. And my gaze went around the pillars of the shrine. There are nearly 1444 pillars, each one unique, though no one is completely sure, as counting them all is very difficult. Legend has it that Dhanna Shah dreamt of a nalini-gulmavimana, which literally means ‘pillar-cluster-flying-palace’ reserved for celestial beings. He asked architects to build him one but none of their designs satisfied him until one carefree artisan named Depa came up with the design that delighted Dhanna. Depa was not popular amongst the artisans: he loved art, hated servility and so preferred poverty to compromise. In Dhanna, he found the perfect patron. Dhanna had the money, the vision, and the faith, while Depa had the sublime artistry needed for the project. So began the construction of one of the finest Jain temples in India. The land was granted by the local king, Rana Kumbha, which is why it is called the Ranakpur temple. There are four images of Adinath here, each facing the four directions. And for each of these images are three-storeyed pillared halls, all of which are located on a high plinth. Seen from a distance, this marble masterpiece spread over 48,000 square feet with 29 halls and 80 domes, topped with flags that flutter in the wind, does look like a flying palace, or vimana. All temples in India are called vimanas, and are considered the flying chariots of the resident deities. Hindu, Buddhist and Jain mythologies speak of these vimanas, the most popular of which is the Pushpaka Vimana of Ravana, king of Lanka. In Jain Ramayanas, Ravana was a Jain, who worshipped Shantinath, and lived in the time of Munisuvrata, who was killed by Lakshmana (not Ram) for the crime of abducting Sita. In a future life, in a future era, after cleansing himself of his karmic burdens, Ravana will become a sage, one who outgrows all desires, and so is able to liberate his soul (jiva) and attain the highest realm of siddha-loka, above the three worlds. Perhaps vimana refers to that which enables the mind (mana, in Sanskrit) to rise and expand to an exalted state where there is no fear or ignorance. And one way of achieving this state is through art and aesthetic. 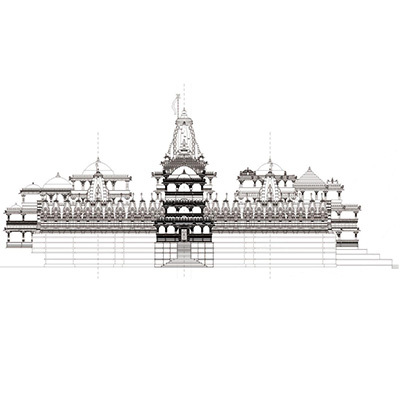 Which is why the Ranakpur temple, which houses four images of world-renouncing ascetics is designed so beautifully. Every pillar is exquisitely carved with images of plants and animals and heroes and damsels and complex geometrical patterns. No two pillars are alike. The pillars are so located that there is always a play of light and shadows and the wind moves such that once you are inside the temple, though located in the desert region, you feel cool. My favourite was the knotted serpent. You cannot find its tail. You sometimes wonder if it is marble, or just lacework, a crochet set in stone. The temple took over 50 years to build and was very popular in the 15th and 16th centuries. In the 17th century, it was abandoned as locals fled in the wake of attacks of Mughals and became a haven for dacoits. Only in the middle of the 20th century were efforts made to restore the temple to its former glory and this was possible thanks to the efforts of the Anandji Kalyanji trust, which for the past 300 years, has been maintaining Jain shrines of the Shvetambara denomination across India. It was reopened for to the public in 1953. They run a canteen in the temple complex where you can eat nourishing Jain food containing hardly any spices and no root vegetables, in keeping with the Jain principle of non-violence. Adinath or Rishabha, was the first king who became a Tirthankara in this era of humanity (there are infinite eras, each with 24 Tirthankaras according to Jain lore). He introduced agriculture and established civilisation. He was born in Ayodhya and he attained liberation atop Mount Kailasa. His son, Bharat, was so great a king that India came to be identified with his name. His daughter, Brahmi, gave the world the Brahmi script. His other daughter, Sundari, gave the world mathematics. This temple befits his glory.